Have you ever wondered why it seems almost everything in life can be made into an analogy of the spiritual life? Some things are more apropos than others, but pretty much every situation, event, and experience, every aspect of creation is somehow analogous to our relationship with God. Of course, the obvious answer is that it was all created by God and therefore must reflect his glory, “I tell you, if [the disciples/you] keep silent, the stones will cry out.” (Luke 19:40) But I think it is also because God planned it this way; he wants us to know and love him and he will do anything to speak to us, to reach us, to reveal himself to us. So he ordered creation so that even the rocks cry out his glorious love for us. Now, the greatest analogy of God’s love is marriage, and it is the goal of marriage to prepare us for heaven… the eternal union with God. But today I want to reflect on another profound analogy of our relationship with God, a favorite of both mine and God’s… the garden. Gardening is on my mind right now since we’ve just started prepping ours for the seeds this Spring. 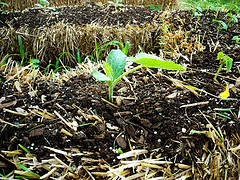 This year, my wife and I are trying something new: straw bale gardening! We’re very excited because there will be no weeding. Over the years, we’ve tried row gardening, square foot gardening, and trellis gardening and we’ve explored other options like raised bed gardening. All have their benefits and drawbacks, but in the process of these experiments I’ve learned something important: that no matter which type of gardening you do or gardener you are, there are a number of universal principles necessary to have a healthy and fruitful garden—and therein lies our first great analogy for gardening. Just as every single garden plot and garden style is unique, so too is every human soul, and so too is the manner in which each soul approaches God. Yet, despite our uniqueness, there are certain constants that each soul requires. Every garden needs light, water, nutrients, and tender care and every soul needs the same: light (faith), water (hope), nutrients (love) and tender care (a personal relationship with Christ). But while every garden needs certain universal things, each absorbs and requires them differently; so too the soul. Each person encounters God uniquely and so it is profoundly important to understand how you personally encounter God. In what manner do I encounter God? How is my soul primarily fed: through beauty, truth, goodness, or unity? In what manner does God stretch me: through acts of service, suffering, or self-discipline? Where do I hear God most clearly: through meditation, the Sacraments, guided meditations, the Rosary, Scripture, or holy conversations? Now use the fruit of your reflection to continue to grow, stretch yourself and produce fruit a hundred-fold. What’s more, every garden needs constant pruning and care. 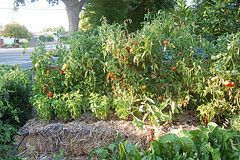 If you’ve ever gardened, you know that to let your garden go untended for more than a week is to court disaster. The fruit of the plants must be culled at the right time, the weeds will quickly overwhelm your garden in what seems like minutes, and the wild animals will ravage anything they can reach; so too with our souls. Make no mistake; the spiritual life is warfare (another analogy, I suppose). The demons (yes, they are as real as you and me) will stop at nothing to tear you away from God— they will nibble and gnaw, tear and chew anything that you leave exposed. Temptation will weed its way into your heart before you even notice it is there and you will find yourself overwhelmed and spiritually undernourished. What about the culling of the fruit? This is something profoundly important but often overlooked in the spiritual life. So often we concern ourselves with rooting out sin (a very important task) that we forget to cull the fruit, we forget to harvest! Each sacrifice, every moment of suffering, every prayer, every single last grace that God pours out upon our lives bears fruit unseen. And so often we have our noses pressed into the mud trying to root out our sins that we forget that abundant fruit is being produced through us and around us! Make no mistake, the weeds must never be forgotten. To drop your guard against temptation for an instant is to court disaster. But to ignore the good that God is doing in you and through you is to ignore hope and joy; because without hope of a resurrection the crucifixion is ludicrous. The deepest desire of the human heart is joy & happiness. Every single action, every single breath is taken in the hope of happiness. (NOTE about how the next time you think your spouse is nagging you remember that she/he only does so because he/she is seeking happiness and is hoping you will help him/her obtain it.) We need to acknowledge the good God is doing in our lives and most importantly we must share it. You do this by engaging in holy conversations about where God is working in your life, by noticing the good in others (especially those that most irritate you), by generously sharing the energizing spirit that you’ve gained from the good fruit with others, etc. So, here we find ourselves, almost through Holy Week, a time of preparation, a time of tilling and sowing and readying the soil of our hearts to receive the seeds of eternal life within us. Whatever your Lent has been up to this point, take these last few days and prepare the soil of your heart for the bountiful goodness of God’s love. Root out the sin in your life. I know for certain that God reveals to us those places in our lives where sin has a strangle hold (such as anger or lust or laziness) and I know that you know what it is in your life. Five minutes of self-reflection is sufficient to reveal your biggest stumbling block. And for these next few days fight with everything you have, like William Wallace of “Brave Heart”, for the freedom that God offers you over this sin. And you will rejoice on the day of victory that God has given you the strength to overcome. Because there’s something pretty cool about our God that so many people take for granted… he will never be outdone in generosity. Let me repeat that… he will NEVER be outdone in generosity! See Matt 20:1-16 for proof. Tags: analogy, encounter, faith, fruit, gardening, generosity, God, Holy Week, hope, Lent, love, prayer, sin, spiritual warfare, weeds, weeping angels | Permalink.